All About Coprinus comatus: The Dissolving Shaggy Mane Mushroom! Coprinus comatus, also known as the shaggy mane, holds a special place in the hearts of wild mushroom lovers. This species is edible, beautiful, and has a method of spore dispersal that seems like it’s right out of a science fiction movie. 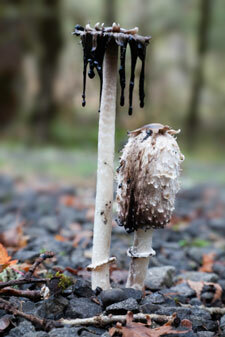 Like a frightened squid or exploding pen, this mushroom releases a black liquid that is laden with spores. As it matures it will deliquesce, meaning it will appear to melt away until only the stem is left. Why does it do this? Due to the tall, dome-like shape of the cap and the fact that the gills are so crowded together, the shaggy mane can’t easily just release its spores into the wind like so many other mushrooms. Deliquescence is nature’s way of making sure the mushroom reproduces. This interesting feature also occurs shortly after the mushroom is picked. Giving a new meaning to the phrase “use it or lose it”. Yes, Coprinus comatus is edible, and a tasty one at that. With a little finesse, they’re a delicious addition to soups, eggs, or stews. Let’s learn more about the aptly named inky cap. First we’ll learn how to identify Coprinus comatus, and move on to how to prepare and cook. I’ve included a simple recipe to get you started. We’ll end with some more fun shaggy facts. Fortunately the shaggy mane mushroom is fairly easy to identify. Its long, cylindrical cap is very unique, and its ability to disintegrate into an inky black mess is unmistakable! That said, identification mistakes do happen. Please don’t eat any mushroom solely based on what you’ve read online. Make sure you’ve identified any edible species at least 3 times before, and nothing replaces hands-on instruction from an expert. Below are the basic identification features. Begins as an oblong shape that covers almost the entire stem. They start out small (around one inch), but can grow to up 6 inches tall. Usually 1 – 2 inches (3 – 5 cm) thick. Color is white with a sometimes brownish circle on top. The shaggy mane gets its name from the scales that flare down and out on the entire cap. The scales are white, sometimes becoming brown at the tip. The gills underneath the cap are crowded and free, which means they’re not attached to the stem of the mushroom. The gills are white but turn pinkish with age, eventually turning black. As the mushroom grows older, the cap begins to flare out a little on the bottom. Eventually it deliquesces (appears to melt) into an inky, black liquid. Only the stem is left behind. 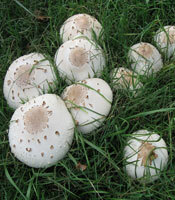 The stem is white, and up to 12 inches (15 cm) tall and less than an inch thick. Smooth, lacking the shaggy scales that are on the cap. The stem has a loose, white ring around it. This is a remnant of the veil that attached the cap to the stem and protected the gills when young. This ring may sometimes fall off or not be easily visible. Inside is hollow, with a long strand of fibrous tissue hanging from the top. Coprinus comatus is classified as a saprotroph, which means it feeds on dead and dying organic matter. Found in fields, grasslands, and meadows. To my knowledge it is not found growing on wood. Also frequently found on the side of roads, paths, or areas where the ground has been disturbed. Appears in Europe, North America, Australia, and other temperate environments. Shaggy manes grow together! While you may find a single one, they commonly grow in dense groups. Where you see one, you’ll often see many more. Summer to fall, often after a heavy rain. Coprinus comatus is considered one of the safest mushrooms to identify, but people do still make mistakes. Below are some of the most common mushroom mix-ups that could theoretically happen. Again, if you’re new to mushroom hunting please get some hands-on experience before you eat anything! Coprinopsis atramentaria – Formerly known as Coprinus atramentarius, also known as the inky cap or tippler’s bane. This mushroom is edible, but contains a chemical known as coprine, which causes severe reactions when mixed with alcohol. So it’s edible and poisonous! These dissolve into ink as well, but the biggest visible difference is that they’re more grey than white without the scales. (Photo by Jerzy Opioła [CC-BY-SA-3.0], via Wikimedia Commons). Coprinopsis picacea – Also known as the Magpie Inkcap. This is a poisonous mushroom found in Europe and North America, although finding them is not very common. When they mature the cap is an obvious brown underneath the scales, but sometimes they can be confused with a shaggy mane when the caps are young. Chlorophyllum molybdites – Also known as the green-spored parasol. This is a very poisonous mushroom that is commonly mistaken for something edible. They’re also white with a brown top, but the scales look slightly different and the cap is not as long and oval. Please learn to identify this mushroom on its own as it’s responsible for many beginner poisonings! Picture by Brian Adamo (adamo588) at Mushroom Observer, a source for mycological images. [CC-BY-SA-3.0], via Wikimedia Commons. So you found or grew some delightful shaggy mane mushrooms and now you want to cook them? You’re in for a treat! Coprinus comatus has a yummy mushroom flavor that’s not overpowering. Time crunch – Coprinus comatus will start to disintegrate fast. Real fast. If you can’t prepare them within a few hours of picking, then you’re probably going to lose them. They don’t keep all that long in the fridge, and drying doesn’t really work either. So have a plan for them when you pick! Water content – Shaggy manes are very watery, something to keep in mind when cooking and cleaning. This can make for a disappointing sauté, so make sure all the moisture is cooked off before eating or including other ingredients. For this reason, many people prefer them in a soup or sauce. Storage – If you don’t have an immediate plan for a big batch o’ shaggy manes, the best thing to do is sauté and freeze them. Make sure you cook them first! Otherwise you may have quite a mess on your hands when you thaw them out. Flavor – These mushrooms have a light, mild flavor that’s tasty, but easily overwhelmed in a dish. If you add too many strong ingredients or other mushrooms, you won’t be able to taste them. They’re best in a simple recipe where their flavor can shine. Flesh – This is a delicate species, so don’t sear the heck out of them on high right out of the gate. They’re best when cooked gently over a medium-low heat. It may take a little longer but it will be worth it. Alcohol – Another species of inky cap, Coprinopsis atramentaria, can cause serious negative reactions when consumed with alcohol due to the presence of the chemical coprine. While the shaggy mane itself does not contain coprine, I have heard of people claiming to get sick when combining them with alcohol. Whether a case of a misidentified mushroom or not I can’t say, but for safety’s sake I’d be cautious when consuming them with booze. These mushrooms work best in simple recipes, and are great as the star of a soup. I for one prefer them with eggs! Clean mushrooms by gently wiping them with a damp cloth. Slice lengthwise. Fry mushroom and shallot pieces gently, sprinkling them with a little salt to draw out more moisture. When the mushrooms start to brown and crisp up just a bit, flip them over to cook the other side. Begin beating the eggs. Pour in the eggs when the mushrooms have browned on the other side and released their water. Continue as you would with an omelet, flipping the eggs over when they’re done on one side and eventually folding together with the cheese inside. Feel free to add anything else you like to this recipe, such as green onions, peppers, garlic, different cheeses, etc. Make the shaggy omelet of your dreams! There have been major name and taxonomy changes regarding this mushroom’s genus. Coprinus used to be huge, but in the early 2000s DNA evidence revealed that most of those species were not as closely related as once thought. Now Coprinus only contains about 4 mushrooms. It is possible to grow Coprinus comatus in an outdoor straw bed or compost pile. You can make a spore slurry yourself or buy the mycelium online. You just have to watch them and make sure you pick before they turn black. You never hear about this, but Coprinus comatus is a medicinal mushroom! They’ve shown anti-tumor activity, a positive influence on blood sugar levels, and even kill nematodes. For the record, “coprinus” means “living on dung”.